Five people, including a Syrian army captain, have been charged over deadly attacks in the northern Lebanese port city of Tripoli. Five people, including a Syrian army captain, were charged on Friday over deadly attacks in the northern Lebanese port city of Tripoli a week ago, a judicial source told AFP. Two Lebanese religious figures were also charged over the twin car bombs outside Sunni mosques on August 23, which killed more than 45 people in the bloodiest attack since Lebanon's 15-year civil war ended. Out of the accused, two Syrians -- including a Captain Mohammed Ali -- are charged with "having placed the two car bombs which killed people", said the source, who declined to be named. Neither of the two are currently in Lebanon, but if convicted, they face the death sentence. The three others are Lebanese, according to AFP. Sheikh Hashem Minkara, the head of al-Tawhid -- a Sunni organization close to the Syrian regime -- is accused of having known about a "terrorist project and not having alerted authorities." He faces three years in jail. His deputy Sheikh Ahmed al-Gharib and a journalist who had previously done some freelance work for Al-Manar, the television channel of the Shiite Hezbollah terror group, are charged with having been "part of a terrorist cell that placed... car bombs which exploded" in front of the mosques. The twin attacks which wounded hundreds came just one week after a blast ripped through a densely populated Shiite area of Beirut, killing dozens. Hezbollah condemned the two explosions in Tripoli, saying the attacks seek to divide the region by inciting sectarian clashes. 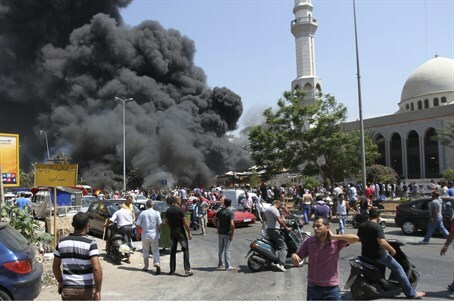 The attacks are a reflection of the sectarian strife in Lebanon, a direct result of the civil war in neighboring Syria. Hezbollah has actively helped Syrian President Bashar Al-Assad’s troops in the war against rebels trying to topple him. Hezbollah leader Hassan Nasrallah has promised that his group will be wherever is needed in Syria and, following the August bombing in the group’s stronghold, declared he was willing to go fight in Syria himself. In response to Hezbollah’s involvement, Sunni clerics have been calling on Lebanese youth to join the war in Syria and fight Hezbollah.